A slow week in the world of technology has afforded me the time to look at some charts which I have not done in a few months. Sometimes separation from daily data points provides the ability to see trends and perspectives not visible on a daily basis. I spent some time looking at a three year chart of the SPX asking myself if I should be putting more cash to work in the market in equities. I thought last year’s market was easy to figure out. The US economy was going to disappoint and all you needed to do to figure this out was talk to people in the real world. Europe was going to blow apart and as such there was going to be a lot soft revenue numbers when Q1-Q3 numbers were reported. This brings us to 2012 and what will the market do. The easy and accurate answer is I do not know and no one else does either, but I think there are few trends and events to think through in the context of the market charts I posted to the left. 1. I think Q4 reports on balance will be a neutral to positive. I think a lot of companies (mainly tech) had a decent Q4 based on end of year demand and this is positive based on reduced expectations. I think forward guidance will be soft, but most investors will give it pass saying it is still early in the year. A few more semi companies will come out, blame floods inThailandand report they under shipped demand, thus pushing the problem out a quarter, kind of like Congress. 2. Congress and the Election. The election is a wildcard. Congress will do nothing meaningful ahead of the election. 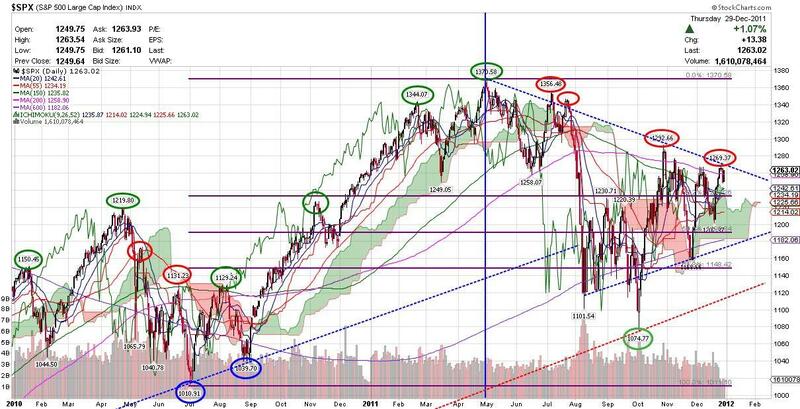 If Obama is reelected the market will not like that and we are in for another four years of nothing. 3. Problems inEuropeare still unresolved. Francewill be downgraded, ECB will print and the low economic activity will just keep the world muddling through. Greeceprobably withdraws from the Eurozone and maybeFranceandGermanyget into a good old fashioned row and we see one side or both mentionAlsaceandLorraine. 4. I do not foresee a broad economic pickup ahead of the election. The trends are better, but uncertainty in policy will keep most CEOs on the far side of conservative for 2012. I think the SMB market adopts a similar approach for 2012. 5. QE3 is a wildcard for the year. I think if the market starts to sense the Fed expanding their balance sheet then the SPX could see a 150-225 point rally. I only think we get QE3 is the economic numbers start to trend negative again so a 200 point rally in the SPX might start from 1075 bringing us right back to where we are today. 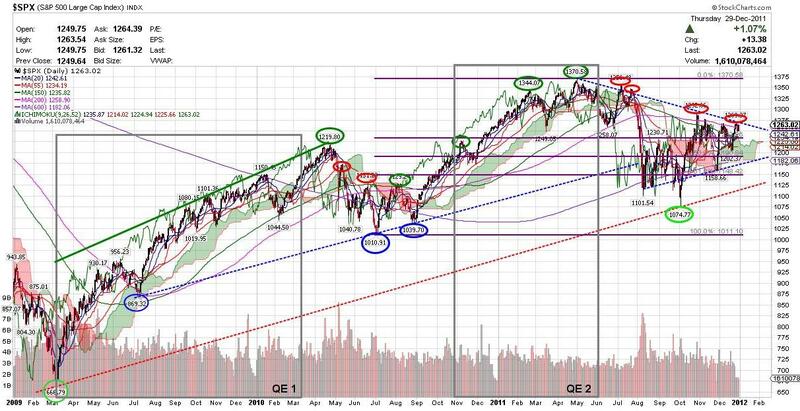 – The SPX has put in a series of lower highs (four) since the market peaked with the end of QE2. This is not a good trend and not something that has really happened in three years. – We are currently completing a wedge and it looks like the SPX will break to the upside or the downside with Q4 reports. That puts a lot pressure on Q4 reports. Currently it appears that the market is setup for a breakout to the upside, but this could change with any bad news out ofEurope. – 1125 seems to be the key support line from the 666 and 1074 lows. Net conclusion…I would trim exposure on any rally in the next couple of weeks and wait to see how European politics play out post the holidays and how guidance will be in Q4 reports. If I am forced to pick tech equities in this market, I would be focused on companies with high GMs delivering a software product in an appliance or compute element. Just random thoughts and most likely I am wrong…happy New Year. ← Are Data Centers the Last Mile of the Twenty-Tens?